Venice Private Tours, Custom Walking Tours of Venice, Venice Museum Tours, Cruise Shore Excursions in Venice, Italy. The Travel Experts in Luxury Vacations in Italy. Providers of Venice private tours. Well Arranged Travel specializes in upscale and luxury tours and vacations to Italy. They provide Venice private tours and shore excursion. Custom private tours, full vacations in Venice, Italy are offered. They can assist you in designing a fabulous itinerary, book a luxury hotel and secure expert tour guides and professional drivers. Please inquire for more details at 1-866-513-3968 or via email at info@wellarrangedtravel.com. Travel to Venice and immerse yourself in the slow rhythms and seductive atmosphere of a city suspended between land and water. Experience the tranquility of a city free of car horns and traffic jams. 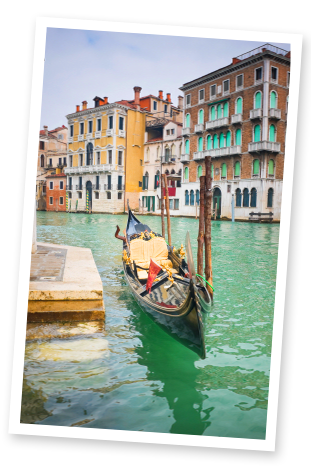 Discover the art, history and allure of a Venice both romantic and mysterious, whose very stones, waterways and rich palazzi evoke the glorious past of the greatest sea power in the Mediterranean. Venice embodies elegance, from its fine fashions and classic monuments to lavish hotels where you will rediscover the hospitality of by-gone times. Dining out here is a treat for the senses, as you feast on the local fruits of the sea, watch the city lights dance on the water, and hear the serenading gondoliers glide by. Don’t leave Italy without a visit to Venezia. Please inquire about one of the published Venice private tours.